How heartwarming to receive this beautiful card from reader Rossella Cottrell in celebration of my recent wedding! The vintage look is right up my street and I love the vellum rose and butterfly embellishments. Heartfelt thanks Rossella - you made my day! I was lucky enough to attend the Paperartsy retailer training day recently and even luckier to leave with this set of stamps by Jo Firth Young. Some of you may remember the bunting I did in the magazine a few months ago with a circus theme. I thought I would do a similer project here, but show how it can look completely different by simply using a different colour scheme and a softer style stamp. I created a crackle base on my beer mats using Fresco Finish paints and the crackle medium between the two layers of colour. I stamped my images directly onto the mats using black Archival Ink and dried this to heat set it. I used the Fresco paints again to colour my images, to do this I put a small spot of colour onto my craft mat, added a small spritz of water to dilute it, and then applied it to the painted image with a fine paint brush. I could see once my images were painted that the background was still too stark, so I dry brushed using the same pink shade I had painted the images with, brushing inwards from the edge so the colour was deeper at the edge and faded as it got towards the middle. I sealed it all with a coat of multi medium. I stamped my words directly onto the mats and coated them with Glossy Accents to make them "pop" a little bit. My smaller mat hanging from the centre is just a larger mat cut in half and coloured, stamped and painted in exactly the same way. I punched holes and added eyelets to each mat as shown. I used jump rings join the mats together, adding a length of chain to each end so it could be hung up. To finish I added a short length of beaded ribbon trim to each of the outer mats using a strong glue. Labels: Carol Fox, Rubber Stamping. Take It, Make It Challenge Three- reminder! How are we all? Melting in this heat? Why not carry that theme through to your craft room and get melting in there too...embossing powder that is! Don't forget about the Take It, Make It challenge! 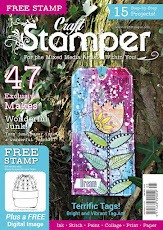 Challenge three still has another couple of weeks to run....there are some fab prizes on offer, and the winner will get published in Craft Stamper magazine! I have a couple more DT samples to show you, in an attempt to inspire you to join in! Backgrounds created just by the use of embossing powder...a fab technique to have a play with! Go on, join in.....you know you want to!! 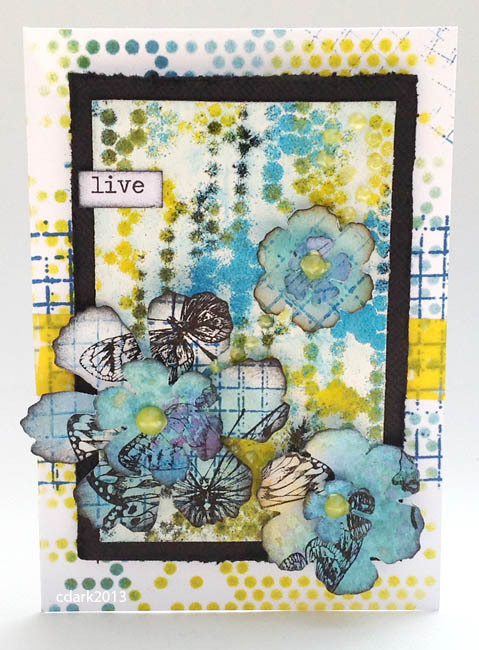 See your card in Craft Stamper! Do you love cardmaking? 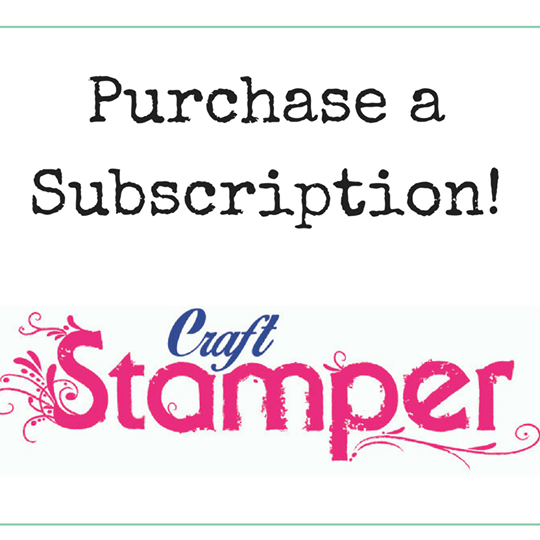 Would you like to see your card published in Craft Stamper? We are looking for reader submissions to our Ready Set Stamp gallery of quick and easy cards. We need new and unseen makes on the following themes. Cold and frosty colours combined with bling, pearls, glitter and anything else that sparkles! Subtle sparkle is hard to photograph so make it bold! The colour scheme is lilac, icy blue and dark purple. A non-traditional colour scheme for a gallery of fresh, modern Christmas cards. The colours are rose pink, blood orange red, and sea green. -No discontinued stamps please - thank you. We look forward to your makes! Good luck! Just in time for the sun we have bright summery issue for you! August issue is on-sale Friday 5th July. LOADS of fabby stuff in this issue. Ways with mica tiles, glass paints, alcohol ink and wire. A fab Distress Stains background and faux embossed metal technique. Gorgeous projects featuring acetate and a fantastic rainbow inking technique (bottom left of cover) from reader Irit Shalom. Our cover girl is Christine Dark. A full list of contents is here. PLUS the free stamp is a funky retro phone by Inky Doodles that we love!